Wooden wicks are easy to light, are known for their natural burning quality, versatility with different types of wax and the crackling campfire glow they emit when lit. Best of all, they're not difficult to make and can save you money in the craft store -- that's more money for wax and other supplies. Tip: Both hard and soft woods can be used to make wood wicks. Balsa wood sticks are long, lightweight wooden craft sticks that can be found at most hobby stores. 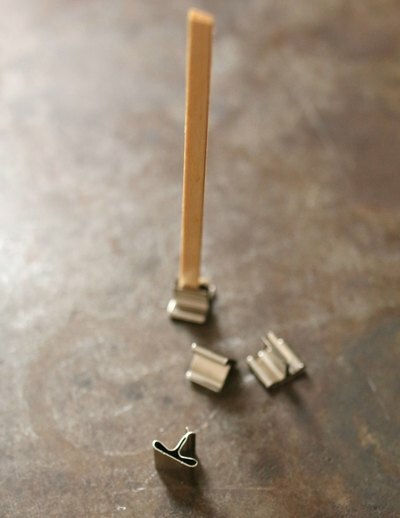 They are budget-friendly and come in several different sizes, which can all be made into wood wicks using this method. 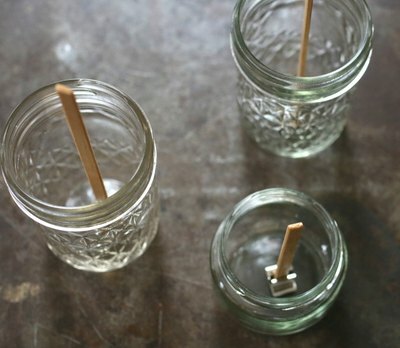 To make these wood wicks, snip the balsa wood stick to your desired wick size. 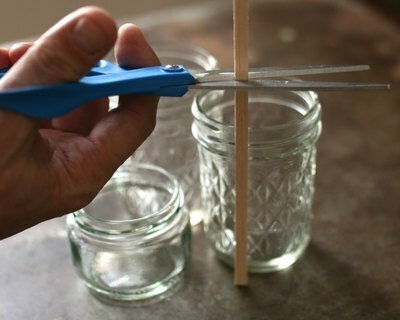 If making the wicks for a specific candle project, cut the wood about 1 inch above your glass candle jar. 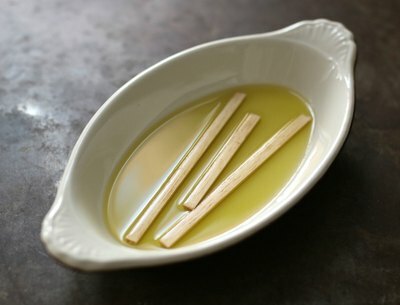 Soak the wood pieces in olive oil for 20 minutes, then remove them and wipe clean with a paper towel. The olive oil coats and soaks into the wood, which will help supplement the burning quality when the candle is lit. 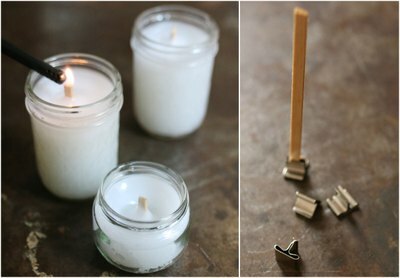 Push the oil-treated wood pieces into wick tabs, and they’re ready for use in your next candle-making project. 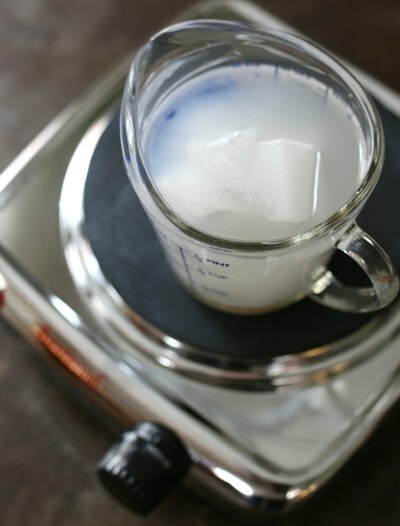 Using wax adhesive, press the wick tab onto the bottom center of the glass jar. The adhesive will help keep the wick centered after the wax is poured. 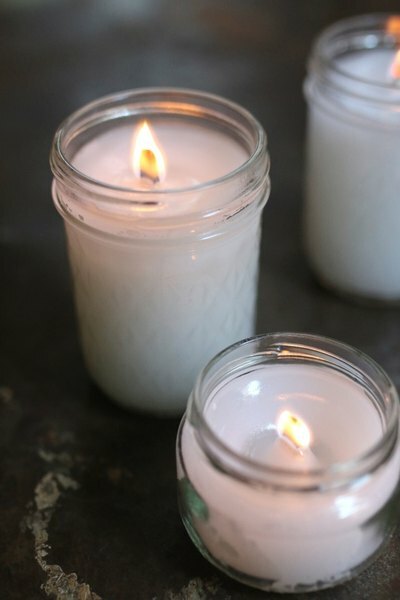 Tip: Mason jars, jelly jars and baby food jars all make recyclable options for candle-making. Cut blocks of wax into pieces, placing into a spouted glass or metal container. Keeping food safety in mind, use a container specifically for candle-making or craft projects; a heat-resistant glass liquid measuring cup works well, so long as it isn't a part of your kitchen tools. Heat the wax over a medium-high heat source, such as on a hot plate or in a double boiler, until completely melted to a clear liquid. Do not to touch the hot glass. Add a few drops of your favorite candle fragrance oil at this stage, if you like. Warm the glass jars just prior to pouring in the liquid wax; doing so will help prevent jump lines in the finished candle. To warm them, cover them in a sink or bowl with hot water and remove with tongs when ready to pour wax. Dry their insides completely before putting wax in them. 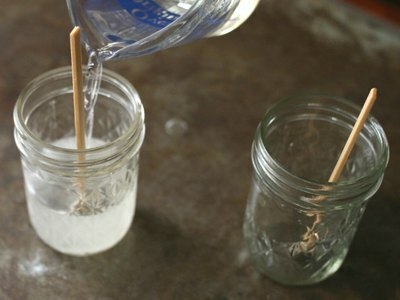 Wearing heat-safe gloves, a hot pad or oven mitt, slowly pour the hot liquid wax into the center of the jar, coating the wooden wick and filling the jar to the base of the rim. Allow the wax to completely cool and harden. 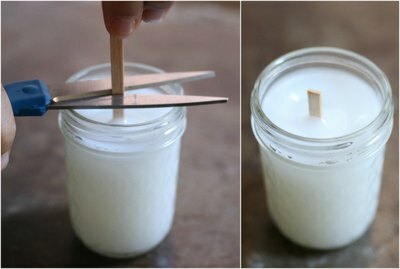 When cool, trim the wooden wick to 1/3 inch above the wax, and they’re ready for use. Tip: Trimming the wicks too close to the wax will make the candle difficult to light. Light the wooden wicks. Always keep a burning candle within sight, and use caution when handling the glass containers after a candle has been burning. Candles make good gifting options and can be made ahead of time to keep on hand for any last-minute gift needs.